There’s a big demand for designers in government. In this post, I’ll explain a few of the ways we work and the different types of design we do in government. Over the years we’ve developed some ways of working that we find work well. We identify then standardise commonly-repeating patterns to help save us time and improve the user experience. This is something that all designers contribute to. The roles are based on what a designer is designing, not the effect that might have – it’s why we don’t have user experience designers. We believe the user experience is everyone's responsibility. Here’s a selection of the different disciplines. 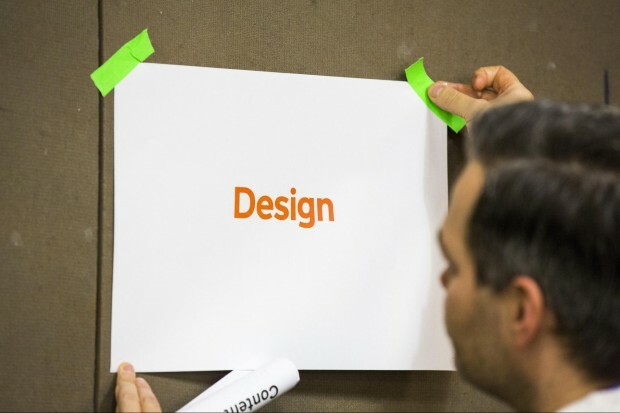 Service designers design services – from end to end, back to front – in all channels. Given a set of policy intents and user needs, a service designer will devise what service meets both of these goals and how it works. Most of this is focussed on redesigning existing services, but since most government services are a collection of isolated transactions and activities, our service designers work like archeologists – piecing together the fragments of a service and working out how that service needs to change to meet user needs. Sometimes this is a radical rethinking, sometimes this is a more gentle reduction in complexity. To learn more about the way our service designers work, take a look at Harry Trimble’s blog post on designing services by building them or this blog post by me on what service design is in government. Interaction designers design the detailed actions a user needs to make in order to use a service. That’s not just the ‘UI’ – it might be the exact pacing of a number of questions within transaction, or the order within a service where a ‘login’ is (or isn’t) appropriate. They refine and shape user journeys and help remove complexity where it isn’t needed. They design for diverse users and platforms and ensure usability and accessibility of the service. They help identify gaps in product understanding, help plan user research and analytics and help inform the design of user journeys. This post by Tim Paul explains the type of problems an interaction designer tackles in government. Graphic design is an enabler for content and interaction design, by influencing how users understand and interact with information. Developing simple information hierarchies ensures that content is legible and easy to read, and that interactions are clearly understood. This post from Stephen McCarthy explains what graphic designers do at GDS and across government. Content designers are writers, editors and arch-communicators. They take user needs communicate complex concepts in simple, plain language that a user can understand quickly. Since the vast majority of our services are made up of words, it’s important to get those right. Most content designers work on services, but others might also write content for a complex campaign, or work on technical documentation for developers. Others will work on content strategies for particular service areas or topics, simplifying and standardising the language within that domain. Either way, content designers make sure that the words we use meet the needs of the user as clearly, simply and quickly as possible. So all of your designers can code, for real? Could you elaborate on this? Do you have examples of stuff your service designers or content designers code? Hi Mark, we think being able to code is a really important part of building anything on the internet - particularly for content designers and service designers who make prototypes to test their thinking. It's important to make the distinction between prototype code and production code. You only need to be able to code enough to show your ideas and test them with users. In many cases this is as simple as copy and pasting the relevant design pattern, and then editing the language used in the questions and answers. I find this really interesting as where I work there is a definite hierarchy to designers and somehow our UX designer is considered far more important than the graphic design role I perform. The irony is my workload requires a variety of graphics on a wide range of media, including exhibition stands, leaflets, posters, websites, interactive applications and animations, video, illustration, infographics and 3D modelling.